The ODC2 ULTRA transponder card is designed for operators to construct scalable networks in a world with exponential increases in both bandwidth demands and robust security with NIST-compliant AES-256 encryption at layer one to secure every byte and at ultra-low latency. This makes it the ideal cost-effective solution for data centres used in applications with an ultra-latency demand like high-frequency trading platforms or disaster recovery to help meet you maximise your revenue opportunities. Utilised in Sorrento Networks’ GigaMux 3200 platform, it provides data centres with one port of 16G Fibre Channel with one port 8G, 4G or 10 Gigabit Ethernet (GE) also supported on both ports. 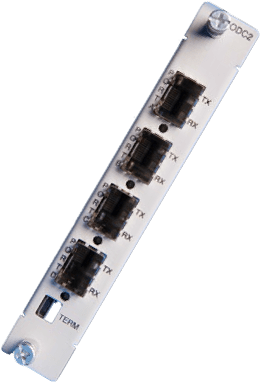 Up to two REGEN instances are supported for each ODC2 ULTRA installed and three-stage regeneration forward error correction (FEC) for when you need your fibre spans to reach further. Our ODC2 ULTRA can dynamically be managed via the GigaView Element Management System (EMS) and the SNMP protocol, where customers can with ease manage network elements, provision services and isolate networking issues quickly and effectively, minimising the need to request engineer assistance.